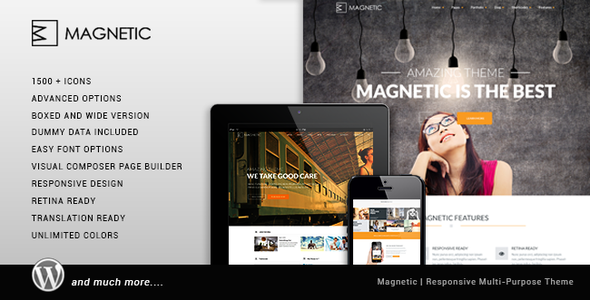 Magnetic is a responsive WordPress Theme for every usage, suited for business websites and users who want to showcase their work on a neat portfolio site. Magnetic is perfect for your client. The Theme is built with KODDE Framework V3 with a lot of new options and Page Builder V3 with drag and drop and resizable blocks, loading with ajax very easy and fast to use. Item Reviewed: Magnetic Creative Responsive Multipurpose Theme 9 out of 10 based on 10 ratings. 9 user reviews.